This simple knot is the most commonly used one and finds application in diverse fields. According to The Ashley Book of Knots, it is the simplest of the single strand stopper knots. Double overhand knot – Larger, more difficult to untie. Prevents fraying and unraveling of rope or yarn ends. Effective stopper for hand sewing. Used as a safety knot by climbers. Helps to keep threads grouped while making a braid. Used as the beginning or part of other knots (e.g. 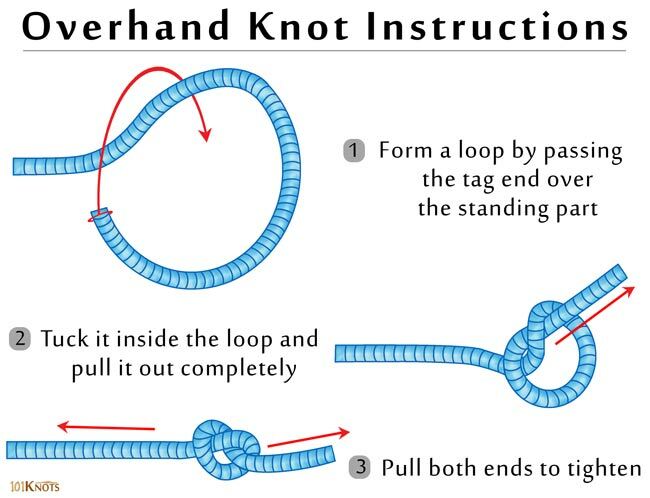 overhand loop knot, fisherman’s knot, square knot). To make an arbor knot, that is used in fishing. For jewelry making such as bracelets. Making no-sew tied fleece blankets.